One of the most striking parts of the Dorset coastline is West Bay, known as the ‘Golden Gateway to the Jurassic Coast’. When the sun shines, the cliffs and long shingle beach positively glow gold. The Jurassic Coast is England’s first natural World Heritage Site, and covers 95 miles of coastline from Exmouth in East Devon to Studland Bay in Dorset. 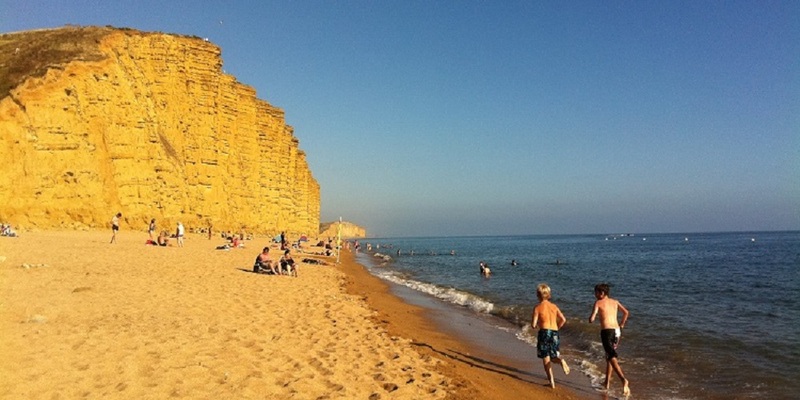 With rocks spanning the Triassic, Jurassic and Cretaceous periods – that’s 185 million years of the Earth’s history – it is famous for its fossil hunting beaches, not to mention being the backdrop for the ITV series ‘Broadchurch’. West Bay itself is a lively fishing village with bustling harbour. It is quite geared towards tourists, as there is a large holiday park on the edge of the village. But don’t let that put you off. This is a great place to get really fresh fish straight off the boat – you certainly won’t go hungry here. Along one side of the harbour are lots of food huts selling takeaway fish and chips, and on the other side of the harbour are waterside cafes. I would definitely recommend Rachel’s Cafe for a bite to eat. West Bay is ideal for a family day out; there’s a big playground as you enter from Bridport, you can go crabbing off the harbour walls, play on the beach or go paddling in the sea. Take a ‘Broadchurch Tour’ – see where it was filmed, hear behind the scenes stories and visit the cafe where it was written. There are plenty of car parks in West Bay. As I have little children with little legs, we usually park in the car park right by the harbour (if there is room!). There is also a toilet by this car park.